I couldn't resist the SALE picture book section...and I was just going to take a quick peak and resist temptation too. Well, I partially met the standard, as I found and bought 4 random picture book treasures for the classroom library! The following grabbed my attention for various reasons. The illustrations are made from vinyl engravings, watercolor washes, and printed wood textures. Yes, please! Besides, who doesn't want to know all about the Sea Horse (Hippocampus)? 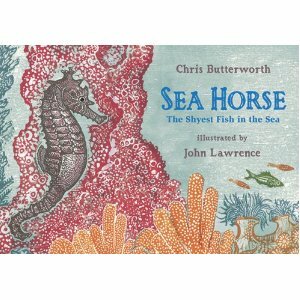 The end papers are decorative and informative, displaying different types of Sea Horse. The text features bold words and an index, and there are facts throughout the text. While we are talking about beautiful illustrations, Philip creates his illustrations by hand, through a layered process of painting, collage, and ink drawings. The type for this book was hand-lettered using rubber letterpress sets salvaged from junk shops across the country! Amazing art work, and the story is fantastic too. 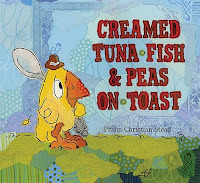 The text has rhythm and fluency, making it fun to reread and read aloud. Interesting word choice with words like wheezed, brandished, chiseled, and complained. 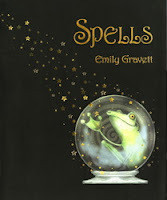 I LOVE Emily Gravett's books, so to discover one of her books I haven't seen before and find it on sale...SCORE! The cover and the illustrations inside are lovely and magical. If you collect books to model art or illustration styles, you would want this book for your collection. I had a group of students who liked to write SPELLS and I was thinking this could serve as a mini lessons on writing spells, and spells gone wrong for our Writer's Notebook. I'll let you know how it goes! The first book I have read where the main character is a clam, and I live in Maine! The illustrations are acrylic and ink and remind me of paintings. Really cute story about a wiggleskin who knows the rules, "Necks out to eat and necks in to hide!" but Edwin's mother always reassured him, "Stick your neck out for adventure like you always do". This advice might come in handy when Edwin's family gets dug by a rough clam digger! I plan to use this as a model for summary vs. theme or the "inner story". The inner story in this book is about individuality, self-confidence, and going for adventure. I am a true graphic novel fan, and I share that love with a large amount of my students. I found this treasure today. Super lovable and cute characters, vibrant colors, and engaging adventure & chase story line. 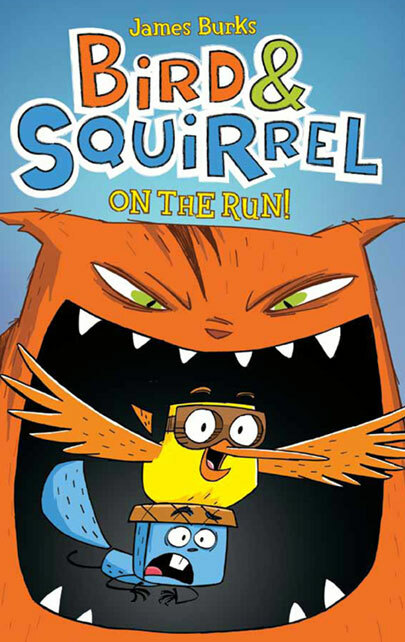 This is a graphix from Scholastic. Highly recommend.. I have been introduced to Matt and Dave's Yuck books. I got two of them, this one shown and Yuck's Slime Monster. Each book has two short stories that are about 50 pages long and include humorous illustrations. I read about Yuck's amazing underpants. YUCK, Gross, OMG!...all appropriate responses to Yuck's relationship with his unwashed, germ riddled, foul underpants. The underpants become an impressive pet of their own! These will be a hit.